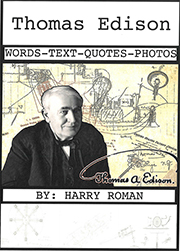 Thomas Edison’s Inventions have made profound impacts on society. So many of Thomas Edison’s inventions are held in such high regard that he is considered the greatest inventor of all time. Following are just a few of Thomas Edison’s inventions as well as Thomas Edison’s patents that he submitted to the patent office. Considered to be the first great Thomas Edison invention, and his life-long favorite, the phonograph would record the spoken voice and play it back. When speaking into the receiver, the sound vibration of the voice would cause a needle to create indentations on a drum wrapped with tin foil. 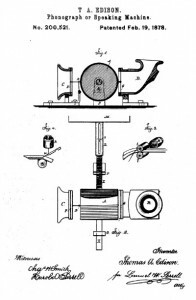 Later Edison would adopt cylinders and discs to permanently record music. 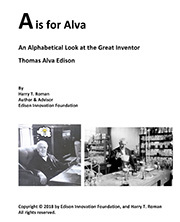 The first recorded message was of Thomas Edison speaking “Mary had a little lamb”, which greatly delighted and surprised Edison and his staff when they first heard it played back to them. Thomas Edison is most well known for his invention of the light bulb. 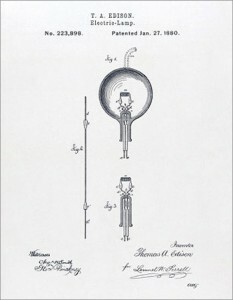 Contrary to popular belief, Edison did not invent the light bulb; it had been around for a number of years. The electric lights at the time, however, were unreliable, expensive, and short-lived. Over twenty distinct efforts by other inventors the world over were already underway when Edison entered the light bulb invention race. By creating a vacuum inside the bulb, finding the right filament to use, and running lower voltage through the bulb, Edison was able to achieve a light bulb that lasted for many hours. This was a substantial improvement, and one that led with more improvements, to making the light bulb practical and economical. Of course, Edison also later invented the entire electric utility system so he could power all those light bulbs, motors and other appliances that soon followed. Edison’s initial work in motion pictures (1888-89) was inspired byMuybridge’s analysis of motion. 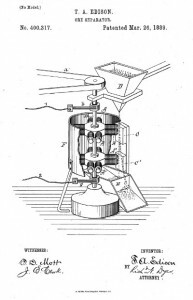 The first Edison device resembled his phonograph, with a spiral arrangement of 1/16 inch photographs made on a cylinder. Viewed with a microscope, these first motion pictures were rather crude, and hard to focus. 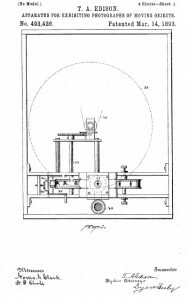 Working with W. K. L. Dickson, Edison then developed the Strip Kinetograph, using George Eastman’s improved 35 mm celluloid film. Cut into continuous strips and perforated along the edges, the film was moved by sprockets in a stop-and-go motion behind the shutter. In Edison’s movie studio, technically known as a Kinetographic Theater, but nicknamed “The Black Maria” (1893), Edison and his staff filmed short movies for later viewing with his peep hole Kinetoscopes (1894). One-person at a time could view the movies via the Kinetoscope. Each Kinetoscope was about 4 feet tall, 20 inches square, and had a peep hole magnifier that allowed the patron to view 50 feet of film in about 20 seconds. A battery-operated lamp allowed the film to be illuminated. 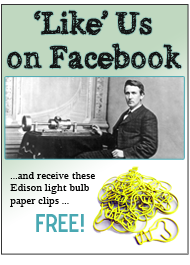 Edison was 22 years old and working as a telegrapher when he filed his first patent for the Electrographic Vote Recorder. The device was made with the goal of helping legislators in the US Congress record their votes in a quicker fashion than the voice vote system. 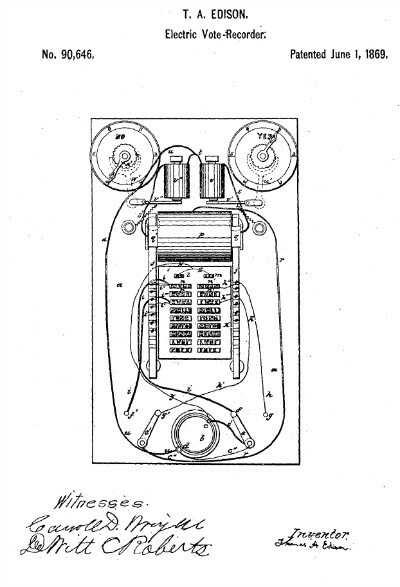 To work, a voting device was connected to a clerk’s desk where the names of the legislators were embedded. The legislators would move a switch to either yes or no, sending electric current to the device at the clerks desk. Yes and No wheels kept track of the votes and tabulated the final results. Engineering problems and a decline in the price of iron ore [the discovery of the Mesabi iron rich ore deposits near the Great Lakes] lead this invention to be abandoned. But later, Edison used what he learned with rock grinding to make his own robust version of Portland Cement, Edison Portland Cement, a very good product that built Yankee Stadium. Along the way, Edison totally revolutionized the cement kiln industry.